A farcical own goal helped Burnley to a fine away victory over Watford. The visitors took the lead when keeper Scott Loach smashed a clearance into the back of Dale Bennett and the ball rebounded into the empty net. Watford levelled when Marvin Sordell crossed for Danny Graham to slot home but Burnley regained the lead through a low finish from Chris Eagles. Chris Iwelumo, who had set up Eagles with a smart one-two, then sealed the win with a header at the back post. While Malky Mackay's side have lost momentum in recent weeks, Burnley's victory puts them just outside the play-off places. Watford, however, should have made the prefect start to this match by scoring after only 17 seconds. On-loan Manchester United midfielder Daniel Drinkwater burst clear but skewed his shot wide. It was a huge let-off for the visitors and they took full advantage to take an eighth-minute lead in crazy circumstances. A through-ball at the end of a decent move was slightly overhit and Loach raced out to clear as Jay Rodriguez chased it down. Loach got there first but smashed his clearance into the back of Bennett who could only watch as the ball flew backwards into his own net. To Watford's credit they were level five minutes later. Sordell pulled off into space on the right and delivered a cross to the near post where Graham got ahead of his marker to score with a low, first-time finish. A cracking first half then saw the visitors come close. Rodriguez did well to beat his man on the right flank and picked out Eagles with a gem of a pass but the former Manchester United man shot straight at Loach. After the break, Eagles showed quick feet to beat Lee Hodson and send in a fine cross which Rodriguez should have converted but volleyed wide. Eagles was the instrumental figure of the second half and deservedly put Burnley ahead after playing a lovely one-two with Iwelumo and clipping the ball under Loach. And Eagles repaid Iwelumo when he provided a cross to back post for the striker to head home. 90:00+5:54 The referee blows his whistle to end the game. 90:00+4:41 The offside flag is raised against Steven Thompson. Free kick taken by Scott Loach. 90:00+2:23 Ross Wallace takes a shot. Save by Scott Loach. 90:00+0:30 Ross Wallace takes a short corner. 90:00+0:30 Substitution Marvin Bartley replaces Chris Eagles. 89:57 Short corner taken by Chris Eagles from the right by-line. 89:13 Andreas Weimann produces a cross, Headed effort from inside the area by Danny Graham misses to the right of the goal. 87:51 Free kick awarded for a foul by Michael Duff on Will Buckley. Andros Townsend takes the free kick. 86:57 Jay Rodriguez takes a shot. John Eustace gets a block in. Short corner taken by Ross Wallace from the left by-line. 84:59 Effort on goal by Adam Thompson from outside the penalty box goes harmlessly over the bar. 84:31 Graham Alexander concedes a free kick for a foul on Andreas Weimann. Direct free kick taken by Lee Hodson. 84:20 Andros Townsend produces a cross, clearance made by Daniel Fox. 82:06 The ball is swung over by John Eustace. 82:06 Substitution Graham Alexander on for Jack Cork. 81:37 Will Buckley produces a cross, save by Lee Grant. 80:20 Andreas Weimann takes a shot. Save made by Lee Grant. 79:35 Lee Hodson takes a shot. Lee Grant makes a save. Outswinging corner taken by Andros Townsend, clearance made by Jack Cork. 78:57 Unfair challenge on Adrian Mariappa by Steven Thompson results in a free kick. Direct free kick taken by Scott Loach. 78:19 Effort on goal by Adam Thompson from outside the penalty box goes harmlessly over the bar. Correction - 76:00 Free kick awarded for an unfair challenge on Will Buckley by Michael Duff. Shot comes in from Andros Townsend from the free kick. Correction - 76:00 Substitution Steven Thompson is brought on as a substitute for Chris Iwelumo. 76:00 Foul by Michael Duff on Will Buckley, free kick awarded. Shot on goal comes in from Andros Townsend from the free kick. 76:00 Substitution Steven Thompson replaces Chris Iwelumo. 74:02 Assist by Chris Eagles. 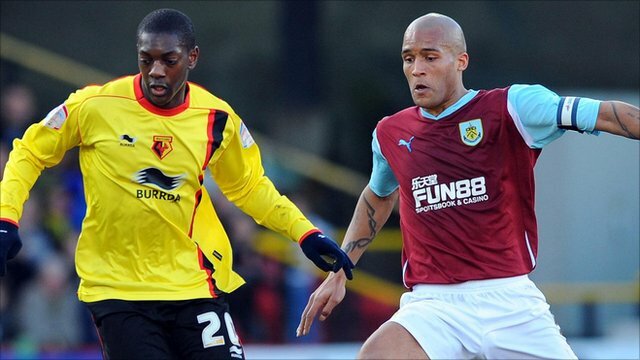 74:02 GOAL - Chris Iwelumo:Watford 1 - 3 Burnley Chris Iwelumo grabs a headed goal from close in. Watford 1-3 Burnley. 71:42 Shot by Daniel Fox from deep inside the penalty area misses to the left of the goal. 71:42 Substitution Andros Townsend is brought on as a substitute for Daniel Drinkwater. 70:35 The ball is crossed by Chris Eagles. 69:49 Free kick awarded for a foul by Will Buckley on Lee Grant. Lee Grant takes the direct free kick. 68:48 Andreas Weimann takes a shot. Save by Lee Grant. Corner taken right-footed by Daniel Drinkwater from the left by-line, save by Lee Grant. 67:16 Shot by Jay Rodriguez from deep inside the penalty area misses to the right of the target. 65:04 Chris Iwelumo provided the assist for the goal. 65:04 GOAL - Chris Eagles:Watford 1 - 2 Burnley Chris Eagles finds the back of the net with a goal from inside the penalty area to the bottom left corner of the goal. Watford 1-2 Burnley. 62:23 Jay Rodriguez gives away a free kick for an unfair challenge on Adrian Mariappa. Direct free kick taken by Scott Loach. 59:30 Daniel Fox challenges Will Buckley unfairly and gives away a free kick. Direct free kick taken by Adam Thompson. 59:30 Booking The referee books Daniel Fox for unsporting behaviour. 56:31 The offside flag is raised against Chris Iwelumo. Indirect free kick taken by Scott Loach. 55:47 Jack Cork fouled by Danny Graham, the ref awards a free kick. Direct free kick taken by Daniel Fox. 55:04 The ball is swung over by Chris Eagles, Shot from inside the six-yard box by Jay Rodriguez goes wide right of the target. 54:37 Substitution Andreas Weimann on for Marvin Sordell. 53:57 Jack Cork fouled by Adam Thompson, the ref awards a free kick. The free kick is delivered left-footed by Daniel Fox from left wing, Adrian Mariappa makes a clearance. 53:15 The offside flag is raised against Marvin Sordell. Indirect free kick taken by Lee Grant. 49:31 The ball is sent over by Adam Thompson, blocked by Jack Cork. Outswinging corner taken right-footed by Daniel Drinkwater, Close range headed effort by Adam Thompson misses to the right of the target. 46:55 Ross Wallace sends in a cross. Chris Iwelumo is ruled offside. Free kick taken by Scott Loach. 45:01 Substitution Dale Bennett goes off and Adam Thompson comes on. 45:00+1:11 The referee calls an end to the first half. 45:00+0:53 The referee blows for offside. Lee Grant takes the indirect free kick. 44:32 The ball is sent over by Lee Hodson, Clarke Carlisle makes a clearance. 43:29 Effort from the edge of the area by Jay Rodriguez goes wide of the left-hand upright. 41:55 Shot from just outside the box by Danny Graham goes over the crossbar. 38:40 The ball is delivered by Adrian Mariappa. 37:51 Martin Taylor concedes a free kick for a foul on Clarke Carlisle. Lee Grant restarts play with the free kick. 36:02 A cross is delivered by Ross Wallace, Martin Taylor makes a clearance. 35:44 The ball is crossed by Ross Wallace, clearance by Adrian Mariappa. 33:39 Jay Rodriguez delivers the ball, save by Scott Loach. 31:02 Tyrone Mears delivers the ball, Chris Iwelumo concedes a free kick for a foul on Dale Bennett. Scott Loach takes the direct free kick. 30:18 Daniel Drinkwater takes a shot. Michael Duff gets a block in. 29:47 Ross Wallace sends in a cross, Scott Loach makes a save. Correction - 28:50 Jack Cork takes a shot. Comfortable save by Scott Loach. Jay Rodriguez challenges John Eustace unfairly and gives away a free kick. Daniel Drinkwater takes the direct free kick. 28:50 Jack Cork takes a shot. Save made by Scott Loach. Free kick awarded for a foul by Jay Rodriguez on John Eustace. Free kick taken by Will Buckley. 28:17 The ball is sent over by Ross Wallace, John Eustace manages to make a clearance. 25:10 Chris Eagles takes a shot. Scott Loach makes a comfortable save. 24:37 Danny Graham is flagged offside by the assistant referee. Lee Grant takes the free kick. 23:40 Daniel Drinkwater crosses the ball, Ross Wallace makes a clearance. 22:33 Ross Wallace sends in a cross, clearance made by Martin Taylor. 20:03 Chris Eagles takes a shot. Save by Scott Loach. Corner taken left-footed by Ross Wallace to the near post, clearance made by Adrian Mariappa. 18:59 The ball is sent over by Stephen McGinn, clearance by Clarke Carlisle. 17:20 Foul by Tyrone Mears on Daniel Drinkwater, free kick awarded. Will Buckley delivers the ball from the free kick right-footed from left channel. 16:59 Marvin Sordell takes a shot. Lee Grant makes a save. 16:20 The ball is crossed by Chris Eagles, save by Scott Loach. 15:11 Free kick awarded for a foul by John Eustace on Jay Rodriguez. Free kick taken by Clarke Carlisle. 15:11 Booking The referee books John Eustace for unsporting behaviour. 14:26 Michael Duff concedes a free kick for a foul on Danny Graham. Scott Loach takes the free kick. 14:00 Free kick awarded for a foul by John Eustace on Jay Rodriguez. Daniel Fox restarts play with the free kick. 13:07 Tyrone Mears fouled by Stephen McGinn, the ref awards a free kick. Ross Wallace crosses the ball in from the free kick, save by Scott Loach. 12:03 The assist for the goal came from Marvin Sordell. 12:03 GOAL - Danny Graham:Watford 1 - 1 Burnley Danny Graham fires in a goal from close range to the bottom left corner of the goal. Watford 1-1 Burnley. 11:20 Unfair challenge on Stephen McGinn by Tyrone Mears results in a free kick. Free kick taken by Adrian Mariappa. 11:20 Booking Tyrone Mears booked. 8:42 Chris Eagles takes a shot. Dale Bennett gets a block in. 7:08 GOAL - Dale Bennett:Watford 0 - 1 Burnley Dale Bennett puts the ball into his own goal. Watford 0-1 Burnley. 5:22 Tyrone Mears challenges Will Buckley unfairly and gives away a free kick. Adrian Mariappa takes the free kick. 5:10 The ball is delivered by Ross Wallace, John Eustace manages to make a clearance. 4:17 Effort from the edge of the box by Chris Iwelumo goes wide of the right-hand upright. 3:25 Corner from the right by-line taken by Ross Wallace, save by Scott Loach. 2:38 Chris Eagles delivers the ball, blocked by Adrian Mariappa. Corner taken left-footed by Ross Wallace, clearance made by Adrian Mariappa. 0:55 Free kick awarded for an unfair challenge on Chris Iwelumo by Dale Bennett. Ross Wallace takes the direct free kick. 0:17 Daniel Drinkwater has an effort at goal from just inside the box that misses to the left of the target.